I don’t know why, but whenever I hear the word “nematode”, I always think of gnomes. I had the unfortunate experience of having to think of nematodes today, so naturally my thoughts turned to gnomes. I’ll have more to say about the nematodes in a minute. As I suspect is the case with most of my fellow travelers through this mass-produced, fast-paced, fully-interconnected, always-on, just-in-time, homogenous, twenty-first century of ours, the first image that comes to mind is that of the ubiquitous ceramic garden gnome statuettes that pop up in as many places around the world as Flat Stanley and that may be colored differently or have different facial features, but pretty much all look alike. But where, I wondered, did the idea for that little guy come from? To answer this question, I did a little research and came up with this gem from the Encyclopedia Brittanica: “In European folklore, dwarfish, subterranean goblin or earth spirit who guards mines of precious treasures hidden in the earth.” That sounds pretty much like the creature caricatured by those statuettes, but it doesn’t do much to explain my mental association with nematodes. The article went on to say that gnomes are “represented in medieval mythologies as a small, physically deformed (usually hunchbacked) creature resembling a dry, gnarled old man.” I read that and the word “Bingo!” was shouted from somewhere in the recesses of my mind and bells started going off. Take a look at the picture below and you’ll understand why. 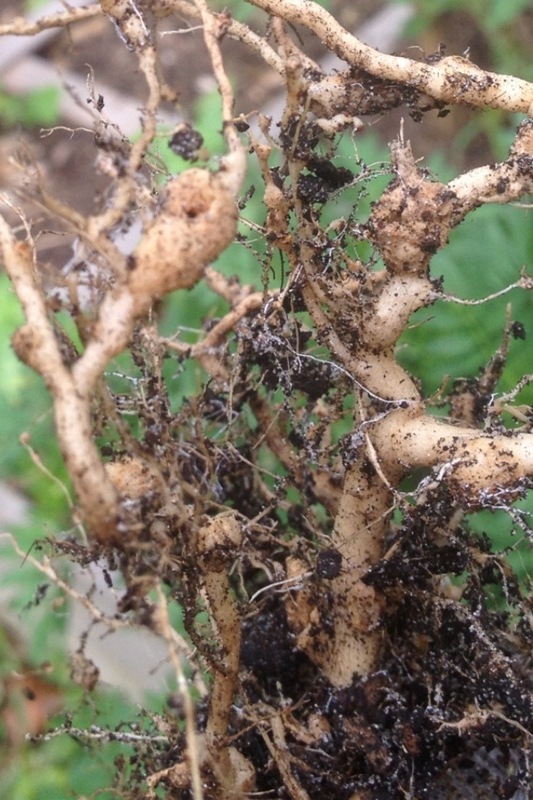 The picture shows the roots of a tomato plant infested with root knot nematode, or simply RKN, as it is known in gardening literature. A number of sources also mentioned the 16th century alchemist Paracelsus, crediting him with popularizing the term. As he described them, gnomes had the ability to move through solid earth in much the same way fish do through water. I guess that explains how the nematode gnomes came to live right beneath one of my best tomato plants. Until a few months ago, this tomato was among the most productive in my entire garden. It was a Super Sioux that I started from seed last August. It regularly bore fruit throughout the winter months and into the spring. At its peak, its longest vines were up past the top of the eight-foot stakes I used to support it. Lately, though, it has been in a state of decline. Its demise started out slowly; enough to give me an excuse to be in denial, but then the decline became precipitous and I knew it was just a matter of time. I tried to stave off the inevitable. I trimmed off the unhealthy vines to allow the plant to direct its energy to new growth. I fed it a well balanced, organic tomato food. I watered it carefully and regularly. It was all to no avail. Today I had to give up and say goodbye to my friend. RKN is a common problem here in Central Florida, so it is not unexpected, merely unwelcome. I had had other tomatoes succumb to this disease in the past, so I recognized the signs: leaves that lose their luster, some leaves that turn yellow and drop off, lack of fruit production, and just a general appearance of declining health. The symptoms are similar to those of tomatoes lacking nutrition. 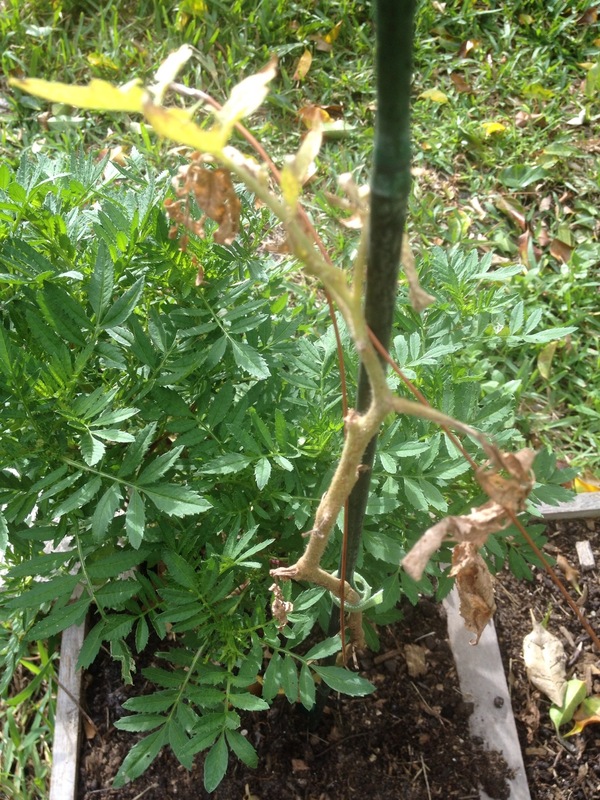 The difference is that a good dose of nutrients does not help to revive an RKN-infected tomato. In fact, the reason for the decline of the plant is that the knots on the roots (a form of scar tissue) prevent the roots from being able to take up nutrients. There are precious few organic remedies for RKN available. One of the best approaches is to cover the soil with black plastic for a few weeks, ideally in the summer, and allow the high temperatures to kill off the nematodes. However, given that I have such limited space to work with and because I have other plants in such close proximity, I have been seeking other methods that won’t require idling so much of my garden for that period of time. The approach I am taking is two-fold. First, I planted French marigolds. As you can see in the picture below, I actually planted one marigold alongside this tomato several weeks ago when I suspected the nematodes. Everything I have read about using marigolds to treat nematodes has emphasized that they need to be French marigolds, not African. Second, I will try to steer toward RKN-resistant varieties of plants for the next planting in this space. 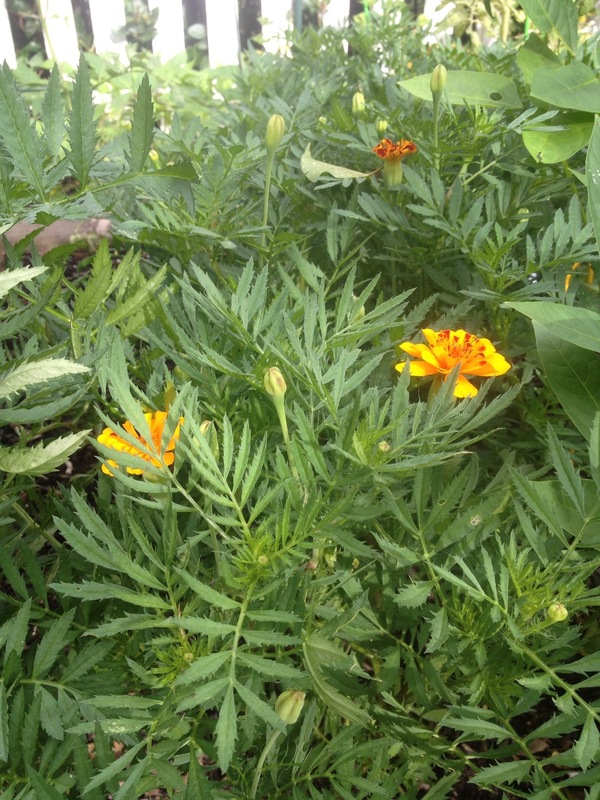 The French marigolds are said to leave behind a substance that is toxic to these pests. By following them with resistant varieties, the hope is to basically starve any nematodes that survive the marigold toxins. If you are like me, you may find it a bit tricky to locate French marigolds. Several months ago when I first discovered an RKN problem elsewhere in my garden, I went looking for a local supplier of French marigold plants so I could get them up and growing quickly. Most of the ones I found at retail outlets were simply labeled “Marigolds” and the sales people were of no help. Some were labeled as African marigolds, but I could not find the French variety anywhere. Failing that, I scoured the seed racks, with pretty much the same result, so I turned to the Internet and quickly found some I liked for a decent price at Amazon.com. They are certified organic French Brocade Marigolds from Seeds of Change. I ordered a pack and planted them right away. In another couple weeks, they should come into full bloom.